Wow! 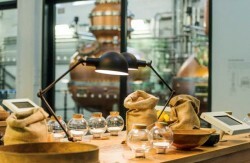 Laverstoke Mill, Bombay Sapphire’s new home, just got even more exciting with the launch of a series of engaging workshops and masterclasses for curious cocktail lovers. The distillery, which offers guests the chance to discover what makes Bombay Sapphire such a distinctive gin, is now home to a variety of sessions for those looking for an even more memoriable visit. Guests will have the opportunity to experience an interactive Gin Workshop and engaging Cocktail Masterclass, each representing a unique journey through the world of Bombay Sapphire. The Cocktail Masterclasses give people the opportunity to enjoy an interactive session, tailored to the tastes of each individual or group. The masterclass will include a series of helpful hints and tips, allowing visitors to recreate iconic cocktails at home with ease. Whilst demonstrating key cocktail equipment, discussing must-have ingredients and talking through step-by-step foolproof methods, the knowledgable gin experts will ensure guests have the opportunity to sample a delicious complimentary cocktail. Visitors inspired to try out their new skills at home can head to The Gin Shop after the masterclass to purchase a range of cocktail-making equipment. Guests opting for a Gin Workshop will take an inspiring trip through the history of Bombay Sapphire, uncovering the craftsmanship that goes into every bottle of the spirit. Resident gin experts will discuss the intricacies of gin, offering visitors the opportunity to touch, smell and taste the ten exotic botanicals that are infused into Bombay Sapphire gin. The hosts will discuss the vapour infusion process occurring on site at the distillery, explaining the benefits of the unique distillation method. Each workshop will then be taken through a step by step guide to creating selected gin cocktails at home, a lasting momento of a visit to the Bombay Sapphire Distillery. All workshops and master classes include ‘The Self-Discovery Experience’, giving guests the chance to explore the stunning distillery with an interactive map. Visitors have the chance to up close and personal with Bombay Sapphire’s production process in the Dakin Still House. Guests can also explore the ten botanicals nurtured in the stunning glasshouses designed by Heatherwick Studio and discover the aromas and unique flavour profile of each of the exotic botanicals in the Botanical Dry Room. There is also the opportunity to explore the rich history of both Laverstoke Mill and Bombay Sapphire within the Heritage Room and Gallery and then browse the limited editions of Bombay Sapphire and cocktail accessories in the Gin Shop. To complete the experience, guests are invited to enjoy a complimentary Bombay Sapphire cocktail in the Mill Bar or on the terrace next to the beautiful River Test. Workshops can be booked in advance via www.distillery.bombaysapphire.com or by phone on 01256 890090. The price of all workshops and masterclasses includes the cost of the Self-Discovery Experience. * Concessions include senior citizens (65+), miltary and emergency services personnel with a valid services card, students with a valid NUS card and carers accompanying a guest requiring special assistance.